DISTURBED has premiered a new video for "The Light”, the current single from their #1 album Immortalized. "The Light" has now become a Top 5 hit at Rock Radio, already following in the footsteps of #1 hit single "The Vengeful One”. The video, directed by Cully Bunker and Craig Bernard, with production by Evan Urman and Jason Valen, can be seen on KNAC.COM right HERE. 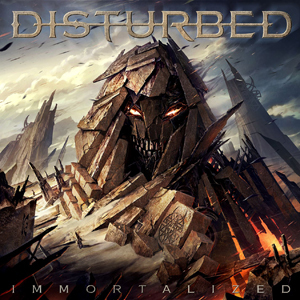 DISTURBED achieved their fifth #1 album on the Billboard 200 chart with Immortalized. It's the fifth straight #1-debuting studio set for the act, making them only the third group to have achieved five consecutive studio efforts to open atop the list. (Only METALLICA and DAVE MATTHEWS BAND have also claimed the unique feat). “The Eye Of The Storm"